ArMS: Architects Marketing Services™ includes not just one application, but several inter-coordinated subsystems working together, like pistons in a powerful engine, guiding Architects to help them market their services. In particular, there is a focus on residential architecture, although there are many practical methods that can help just about any architectural or other professional services firm to help market what they do. This unique approach has a specific graphic diagram for each method, or other guide, some keyed to timed emails and responses to Clients, some of the methods depicting what to do over months and years of sustained marketing efforts, with detailed information to help you with each step, as you work your way in real life, through the methods. There are presently 3 detailed overlapping subsystems that reinforce each other, merging to create a multi-pronged approach to architectural marketing. ArMS™ (Architects Marketing Services) includes several methods from ArCH that can dramatically improve just about any residential Architect’s (or other Architect’s) “hit ratio” when marketing their services. When you purchase this ArCHproduct, that will give you access to ALL of the Architects Marketing Services methods below, including to those added to this product in the future, as they become available, for a 3-year continuous period. Which is an amazing deal. After 3 years, if you’d like to renew to have access to additional, new methods being added, you may, for a discounted renewal price (approximately half of your initial investment). Please see below for more information and file types and software required to open the files. You can enter your ArCH discount coupon code in the Shopping Cart during the order process to reduce your cost (if you are an ArCHmember). If you don’t have the coupon code for this product, click here–> ContactArCH and ask for it (you must be a member to obtain the code). Apple-Mac computers and OS may or may not have issues, but probably will. ArCH cannot assist you in loading and migrating the files and cannot issue refunds once you have the electronic files. Your choice to do otherwise is your decision. Click on the Add To Cart button above to order, pay online & download Architects Marketing Services. There are several marketing services files to download. Make sure that you download them all. At present: there are 3. Architectural Marketing Services: this system is a simple listing of files to download, in the checkout process. Each file has a different architectural marketing method, that also overlaps with the others. These different methods are numbered and/or named differently so that you can understand the purpose for which you might want to use each one. When you pay for ArCH-ArMS™ (Architects Marketing Services) you are obtaining ALL ArMS™ files: from now and into the future, for 3 years from your date of purchase. Unlike some other subscription systems, this is a one-payment, enjoy new content for 3 years, then if after that time, you’d like to renew, you may, for about half of what you initially paid, for each block of 3 years into the future. How’s that for a bargain? Each ArMS™ method contains a detailed process diagram with milestones moving through time and events in the process. There is explanatory text under/near each milestone, describing what you, as the Architect trying to secure this project (and/or Client) should be doing, and commenting on what the potential Clients are likely doing and how they are likely reacting to what you are doing. One extensive and detailed step-by-step diagram/guide per method for each marketing effort. Simple. Easy to understand. Easy to apply to your practice. As future ArMS™ methods are added, you will be able to choose which method to apply to which situation in your marketing efforts. The approach is that they are mutually reinforcing. Oooooo. Marketing. Mysterious. Troublesome. Costly. Difficult. Like a foreign language. Any kind of marketing begins with being responsive to the people who indicate an interest in your services. It’s really that simple. HOW you respond and How Often you respond and WHEN you respond and WHAT you say, is what most marketing concerns. Realize one main thing: treat people the same way you would like to be treated. Everything else involves technique, timing and details. People are people. So are you. Handle the people who contact you the way you would like to be dealt with when you are shopping for a new vehicle, buying a house, hiring an Attorney, CPA, finding the right Dentist or other Doctor for you and your family’s health. Be nice. Treat them with courtesy. Answer their questions. HOW and WHEN you do these things is what much of marketing services involves. So: wipe away your fears about marketing. It is really nothing strange, foreign or overly difficult. It mainly requires common sense, persistence and an even and pleasant temperament. Do that and be that and you should do well. ArCH ArMS™ (Architects Marketing Services) can help. Having said all of that, yes, there is an aspect to producing something in terms of marketing that compels people to contact you in the first place. That is dealt with as well, in the ArCH-ArMS system. Guide diagram with detailed notes from first contact through closing the deal. Procedural diagrammed guide starting from Being Noticed, through your 1st, 2nd, 3rd and other responses and interactions with the potential Client, leading up to an initial modest Introductory service and Closing the Deal to becoming their Architect. A robust 3D Excel spreadsheet file that links many individual Client contract records to a Master List, allowing you to conveniently monitor and update when to send future emails to potential Clients, from their first inquiry with you through future months and years. Also includes hot links to example email format/content appropriate to each stage of the developing Client relationship, helping you to stay engaged with the potential Client into the future, with the goal of them finally becoming paying Clients. A checklist that guides you to develop features for yourself that results in improving the likelihood that People Contact You. Each of the subsystems in the ArCH-ArMS™ system were developed to assist Architects in dealing with various potential Client situations. It is the intent of the ArMS™ overall system that each of its subsystems be used and coordinated with the others to result in a more comprehensive and successful approach to architectural marketing of services. For instance: the PCY™ subsystem is what should be in place and operating for the first diagram box of the INTRO™ subsystem to properly function (which is: “Be Noticed”). And the various communications that take place in the INTRO™ system would be best managed using the MarCCon™ (Marketing Client Contact) subsystem. And MarCCon™ aides with Credibility Building (in INTRO™) through the MarCCon™ various implementations, such as where MarCCon™ suggests that you request permission to put your potential Clients on your e-newsletter subscription list. The point is: ALL of these subsystems are intended to overlap and reinforce the others. Do coordinate between them all to achieve best results. Note about other ArCH system and documents: ArCHproducts are all coordinated with each other. You will see references, for instance, to ArCH-AOA™ (Architect-Owner Agreement) in ArCH-ArMS™. This is because the AOA™ has certain information in it that assists certain aspects of the ArMS™ marketing system in such matters as the presentation of the Professional Service Package Menu (which is part of the AOA™), which for all intents IS a marketing presentation as much as it is a business coordination function with the potential Client. The point is: ALL ArCHproducts are coordinate with each other: marketing, forms of agreement, specifications and other related items. That’s part of the beauty of the system: it dovetails with other ArCHproducts that you may very well be using. The first method is called: ArCH-ArMS-Intro™ (subtitled: Walk Your Land), which starts with you, as an Architect, offering an economical INTROductory service (which can involve other activities as well), then goes from there. One of the many INTRO services relates to Site Analysis, however, this diagram can be easily modified to suit many preliminary services. The ArCHprocess indicated has a proven track record of success. What you’re not seeing here, is the detailed individual steps helping to make this process work. For that; you’re going to need to purchase the ArMS: Architects Marketing Services™ product and download this file, with the complete, expanded description in detail, including what to do in each step. Note: the above diagram has been greatly expanded in the actual product file that you will download, with much more explanation and guidance. The above method spreadsheet with full diagram is now available when you purchase ArCH-ArMS™. Note 1: the “Be Noticed” step in the INTRO™ system above can be put into motion by adhering to the recommendations found in the ArCH-ArMS: PCY™ subsystem (below on this webpage). Note 2: The idealized swift communications indicated in the INTRO™ diagram/system will likely need to have the assistance of the ArCH-ArMS: MarCCon™ subsystem (below on this webpage) to help you manage the ongoing developing potential Client contacts and emails. ARE YOU NOT FOLLOWING-UP WITH POTENTIAL CLIENTS THAT PHONE OR EMAIL YOU? ARE YOU LOSING WORK BECAUSE OF THIS? Are you overwhelmed and not know how to manage the phone calls and email leads that you receive? Do you simply forget about them after making an initial return call or reply email? Don’t stop there! Architects marketing their services need to realize that those people contacting them need to be repeatedly and professionally responded to multiple times. After all; they’re interested in what you have to offer, or they wouldn’t have contacted you in the first place. Don’t let them slip between your fingers, just because you don’t know how to track the critical “incubation” period during which part of your duties in your Architect’s role is to turn them from Potential Clients into Paying Clients. The ArCH ArMS MarCCon™ system helps you manage all your leads and inquiries to help you do just that. Did you know that most marketing pros will tell you that it takes a minimum of 5 to 8 or more “contacts” between you and the people talking with you about your services before they actually become your paying Clients? However, some potential Clients can take weeks, months or even years of careful nurturing in which it is YOUR job to keep them engaged and learning about what you and your firm does until they become Clients. That is precisely why the MarCCon™ system (Marketing Client Contact) has been created: it helps you do exactly that! OBTAINING NEW ARCHITECTURAL CLIENTS DOESN’T JUST HAPPEN THROUGH A SINGLE PHONE CALL OR A SINGLE EMAIL. Architectural marketing is like tending to an organic garden. You have to always be planting seeds, then carefully watering and feeding them. The ArCH ArMS MarCCon™ system helps you accomplish that. This is a powerful 3-Dimensional MS Excel spreadsheet format that is to be used for each of your potential Clients, while they are incubating: becoming actual Clients. This is just one of the files that you will be able to download when you purchase ArCH-ArMS Architects Marketing Services. This is a heavyweight system that works. 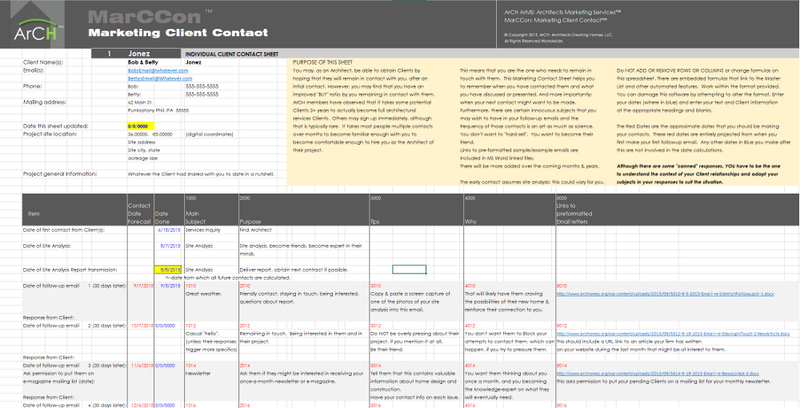 This is only a very small section of a single one of the 24 linked individual Client Contact sheets, which are then unified on the Master List spreadsheet. This file contains a well-thought-out grouping of spreadsheets into one massive Excel file, with lists that allow you to strategize and document about 30 months worth of emails to & from each pending Client while they are “incubating” (becoming actual, paying Clients). This file explains the purpose of follow-up emails and in all cases, includes hotlinks to MS Word example emails that you can use in your practice, modified to suit each Client’s circumstances, as you wish. Tips and reasons Why are included for when you should make follow-up emails to your potential Clients. There is also a powerful Master List for the MarCCon (Marketing Client Contact) system, that has links to 24 pending Client Contact spreadsheets. Important dates that you enter on each Client Contact sheet are automatically linked to the schedule of contacts on the Master List, allowing you to easily understand what Client contact you need to update and when. This one powerful system alone can help you, as an Architect, to track and update your pending leads and help you turn them into paying Clients, with your considered guidance and management. That’s part of the key with MarCCon: to provide a detailed and extensive system of Client Contacts, rather than forgetting about who contacted you and why and to help guide you to nurturing those early contacts into meaningful relationships over months & years, in which they grow to trust you over time, as this system helps you understand how and when to help educate your pending Clients, with you as the expert specialist. This one system alone makes it worth purchasing the ArCH-ArMS Architectural Marketing Services product. “I don’t keep track of calls to me or who emails me about possible projects,” said John, an Architect, “I just figure if they want to hire me, they’ll call me or email me back again someday.” Guess again, John. Because while you’re totally ignoring your marketing leads, other Architects, Contractors and even unlicensed designers are carefully tracking them, responding to them and reminding them that they are interested in their project and giving them repeated reasons why they should engage those people rather than you. All it would take is for John to buy ArCH-ArMS Architectural Marketing Services and then initiate one of the sub-systems like the ArCH MarCCon, which would allow John to understand, monitor & organize when and how to respond to his possible Clients, increasing the likelihood of turning them into real, paying Clients. Architectural marketing gurus have said that it takes multiple Potential Client contacts with the Architect for the Potential Client to feel comfortable enough to sign a contract with the Architect. This Architects Marketing Services system helps you build that trust and interest over the coming months and years with each and every Client, eventually resulting in higher chances of obtaining a more paying Clients. This is a checklist in Excel that requires you to produce certain things. As you create these things, you should notice something happening: People Contacting You. And when you are finally through the entire checklist, you should be well on your way to having People Contact You more regularly. No one can guarantee that what you produce will assure this, however, if you comply with all of the recommendations on this checklist, using tried and true methods that have worked for others for decades, this has got to help your situation with more People Contacting You. Many Architects who are looking for work wonder how to obtain People Contacting Them. They wonder how to get their phones ringing and their emails receiving interested inquiries from potential Clients. This checklist helps you with that. One thing is just about for sure: when you call other people looking for work, that nearly guarantees that you get nothing except wasted time. You really need potential Clients noticing you and then contacting you: that’s half the battle. So how to get this miracle working? 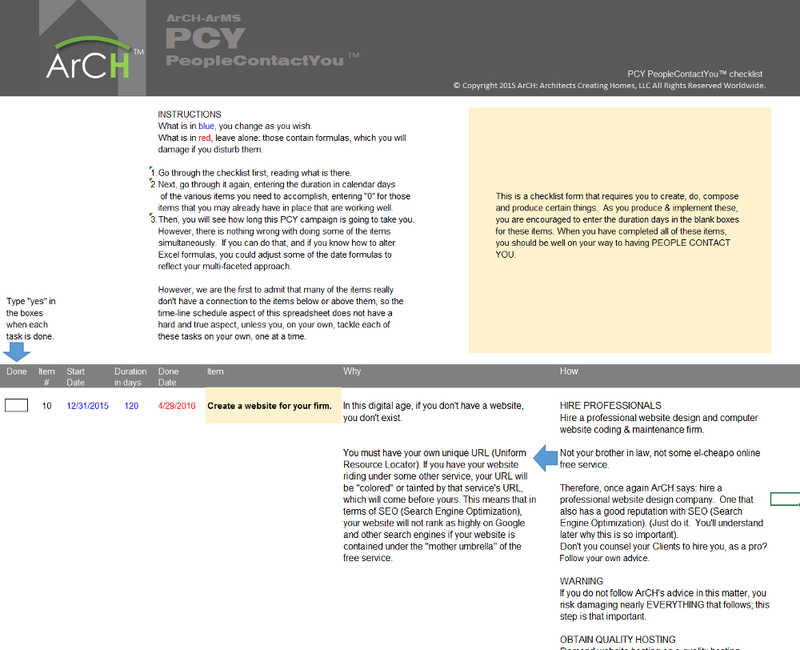 Answer: buy ArCH-ArMS™, which includes the PCY™ application (PeopleContactYou). Note: this entire PCY system is the secret ingredient that helps you “Be Noticed” in the ArCH-ArMS: INTRO™ subsystem #1000. The image above is just one small portion of the ArCH-ArMS-PCY™ application checklist. When you buy ArCH-ArMS™, you obtain all of the files in the entire system. 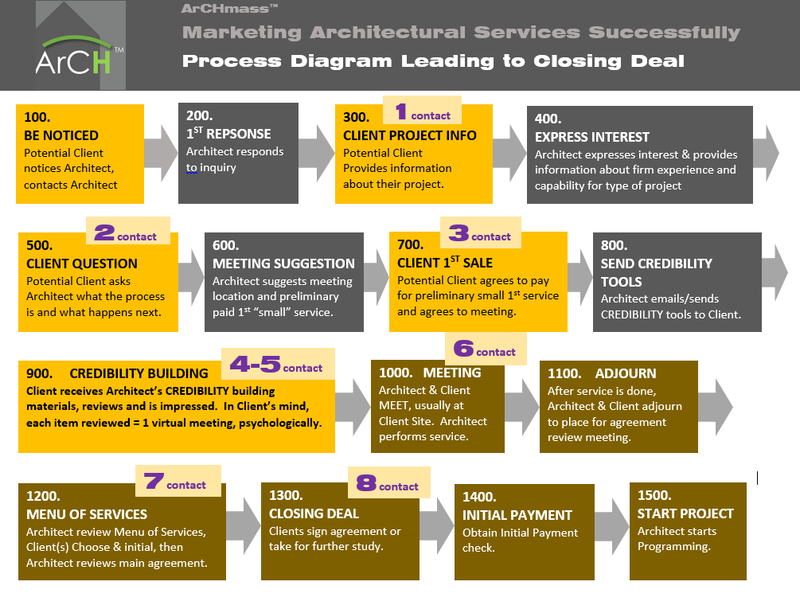 ArCH-ArMS (Architects Marketing Services) is one of the only marketing systems available in the world that has been created by licensed, practicing Architects who are documenting what works and what doesn’t, from lifetimes of trial & error. This is not guesswork created from marketing people. Architects who live or die by how well their marketing works created this system. These are easy to understand, logical diagrams that graphically illustrate the step 1, step 2, step 3, etc, for each marketing method, with ample text instructions under each milestone box (in Excel) to help you understand what to do to improve the likelihood of your successfully obtaining a project using these methods. Each method has its own diagram with instructions for each.